Fairfield Warde's Sofiene Afif (21) walks away from the Fairfield Ludlowe student body celebrating the Falcons' 1-0 FCIAC boys soccer victory on Thursday, Oct. 10 at Tetreau/Davis Field. 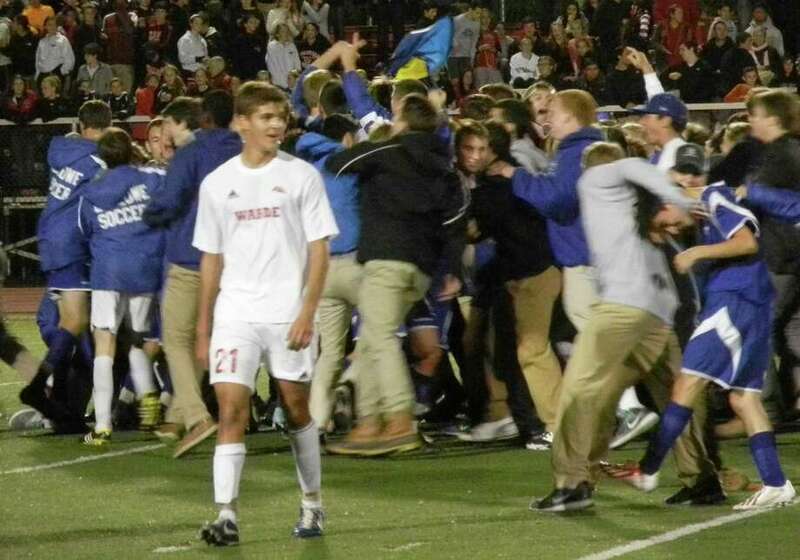 For the first time in six years, a winner has been declared in the annual Warde-Ludlowe boys soccer match. The streak of five successive years with a draw ended on Thursday night at the Mustangs' Tetreau/Davis Field when the Falcons scored a second-half goal on one of Warde's few defensive breakdowns of the match. Ludlowe maintains possession of the Swedish Cup, unofficially going to the winner of the cross-town rivalry each year. In the last nine Ludlowe-Warde meetings, the Falcons are 3-0-6. Ludlowe's 1-0 victory, in the FCIAC game, left the Falcons with overall and conference records of 8-3-0, putting an end to a two-game losing streak that followed a seven-game winning spree. The Mustangs' two-game winning streak came to a finish as well. Warde's FCIAC and overall records dropped to 6-4-3. Matthew Galle, a junior, received a cross from sophomore Brendan Layne from the left side after Warde could not clear Ludlowe senior Erik Stahle's corner kick from the right wing. Galle headed home his third goal of the season from the top of the 6-yard box in the 19th minute of the second half. "It happened all so fast," Galle said. "I kind of had tunnel vision. I was in the middle of the (penalty) area, and no one was on me. I just flicked the ball with my head. "I saw (Warde goalkeeper) Michael (Lerman) there. He's on my premier (travel) team. It was weird seeing my friend in the game," Galle said. "It wasn't the perfect goal," said Ludowe coach Kevin O'Hara. "Sometimes you just have to crash the area. Sometimes you get a little fortunate on those plays. He's actually our smallest guy." Galle was a giant at the pivotal time in a part of the field where size often matters. "This was probably our best defensive game of the year," Warde coach Justin Ottavio said. "We cleared the ball, and we played composed. We didn't get nervous, we didn't lose our shape, except we had one breakdown. We didn't play the ball out (of danger). We probably got caught ball-watching a bit on the goal. We were a little out of position. "Sometimes the ball falls in your favor; sometimes it does not." Warde's best chances to score came early in the second half, after Ludlowe established a slight edge in play in the first half. The Mustangs got three of their four shots for the game in the opening five minutes of the second half. Ludlowe survived the storm. Sophomore goalie Frederick Meagher made a big save on Warde's Peter Stymacks during that span. "He made a star save," Ottavio said of Meagher. "It was quite impressive." Meagher dove to his left to knock the shot aside. "Warde sustained some pressure on us," O'Hara said. "They were all over us at times. They easily could have gotten a goal or two early in the second half. It was a nice win after we hit a bump in the road. I could see when I first saw them today that they were fired up to play." Records: FL--8-3-0, 8-3-0 FCIAC; FW--6-4-3, 6-4-3 FCIAC. Goal: FL--Matthew Galle. Assist: FL--Brendan Layne. Goalies: FL--Frederick Meagher (3 saves); FW--Michael Lerman (8 saves). Shots: FL--10; FW--4.